The Summer is a time where families and friends come together. Dads find themselves taking their child’s hand and leading them through the park. Mothers often think ahead and make sure everyone has what they need for the day. It’s on those days that battery packs are fully charged and the fun really begins. NZ Hobbies, an e-commerce shop that specializes in remote-controlled cars, airplanes and boats, has teamed up with OC Designs Online. The shop has a custom red, white and blue eBay store design that easily brings family fun on holidays like the Fourth of July. After skimming over a wide array of eBay templates NZ Hobbies takes first with this eBay shop design. The logo waves the checkered finish flag at the top of the welcome pane with a RC car racing off to the left. Neighboring the logo is a search tab to the right. This tab enables online shoppers to search the store for their desired products with ease and simplicity. Below the logo and search tab is a panel spotlighting store categories. 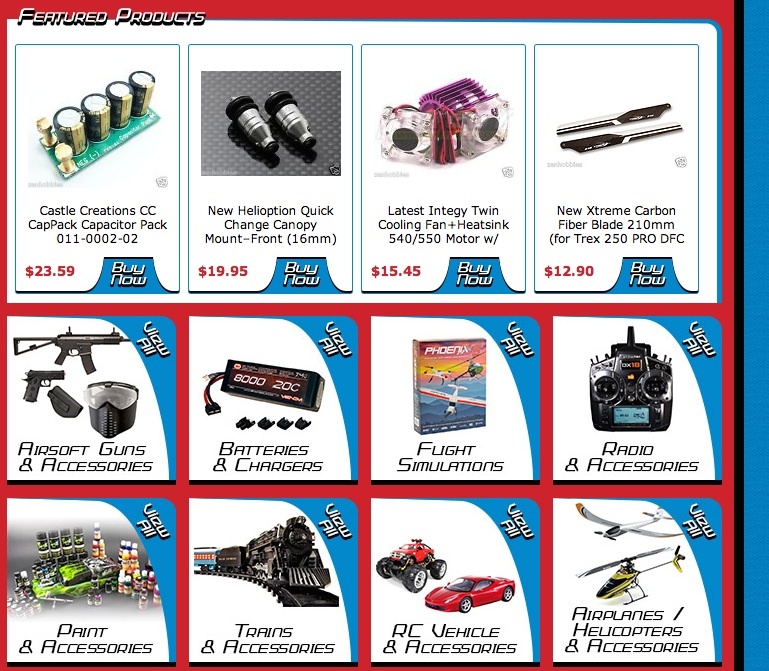 NZ Hobbies has a variety to choose from whether it’s RC vehicles, helicopters or trains. This eBay store design offers a second and more in-depth store category tab which lines the left hand side of the welcome pane. With a scrolling picture tab in the center of the welcome pane the page is always new and exciting at every glance! There’s often a desire to see what the top deals and steals are with every store. This eBay shop design dedicates the midsection to featured products within the site. Store categories are also listed again but this time with a visual. OC Designs recognizes that many online shoppers are visual and lures customers in with top of the line battery operated electronics! To hear a Top 10 list many people tune into the David Letterman show. NZ Hobbies took notes and has listed out the top 10 reasons to shop at the store. Lowest prices in the market and hard to beat shipping savings are just two of the many perks at NZ Hobbies! Team up with OC Designs Online for a one-of-a-kind design that meets your needs as well as the needs of your RC operated fanatics. Take some time to browse our portfolio of flashy store designs, and then request a free quote. Don’t forget to find us on Facebook, follow us on Twitter and check out our Google+ Page!